Talking with WKYC, Cleveland Indians President Chris Antonetti addressed the rumors that have swirled around his pitching staff this offseason. CLEVELAND -- As the 2018 season came to an end, Chris Antonetti knew the realities of his roster. So before his players dispersed for their extended winter vacations, the Cleveland Indians President addressed the trade rumors that were likely coming with the players who they would likely involve. 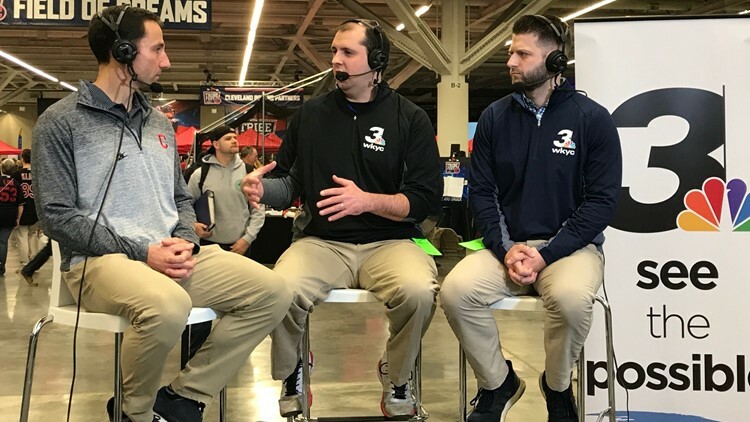 "It's hard, [but] it's the reality of business," Antonetti told WKYC during an interview session at the team's annual Tribe Fest on Saturday. "At the beginning of the offseason I actually reached out to those guys and shared, 'Hey, this might happen because it's the way baseball works.'" While the Indians' offseason has been relatively uneventful -- save for the trading of Yan Gomes, swapping of Edwin Encarnacion for a returning Carlos Santana and the free agent departure of Michael Brantley -- it's been far from quiet. Each day this offseason has seemed to bring a new trade rumor centered around Cleveland's pitching staff -- in particular, starters Corey Kluber and Trevor Bauer. To this point, the Indians have done little to deny that such rumblings are based in reality. In fact, on Saturday, players, coaches and front office members alike acknowledged the trade talks, with each noting that if the team were to make a deal, it would be doing so from a position of strength. "It would be more concerning to me if our players weren't being rumored. Because that would mean we wouldn't have players that other teams wanted to acquire," Antonetti said. "And so when you're in the position that we are as an organization where we have a lot of players at the Major League level and at the minor league level that other teams want, it leads to a lot of conversation between teams. That's actually a healthy thing, as uncomfortable as it might be as we're going through it." That Kluber and Bauer's names have been mentioned most might be academic. Between Carlos Carrasco's extension and the development of Mike Clevinger and Shane Bieber, the Indians' starting pitching currently consists of something between a surplus and embarrassment of riches. Factor in the holes Cleveland still needs to fill -- particularly in the outfield -- and more movement may even be necessary. And there may not be a better way for the Indians to maximize their return than by dealing an established arm. To this point, Antonetti and general manager Mike Chernoff still seem to be fielding offers and it's worth noting that both Kluber and Bauer were in attendance at Tribe Fest. Trade rumors have linked both pitchers to a number of teams, including the Yankees, Dodgers, Brewers, Phillies, Padres and Reds. With the way the calendar of baseball's offseason has shifted, there's no telling what the timetable for a potential deal might be. But with pitchers and catchers set to report to Spring Training in two weeks, time to make a trade could soon be running out. Then again, uncomfortable conversations have become somewhat of a theme for the Indians this offseason. "Guys understand the nature of the way the business has evolved," Antonetti said. "First and foremost, let's realize these are peoples' lives we're dealing with and we always try to treat it as professionally and respectfully as we possibly can.